Be in control of your IT operations and processes with Comodo's automation engine. You can find scripts made by your peers by exploring the large shared library or create your own custom monitoring and recovery functions in Python. Or, you can ask the Comodo team and we will write the script you need for free. Easily audit and inventory your IT infrastructure regularly with a consistent methodology. 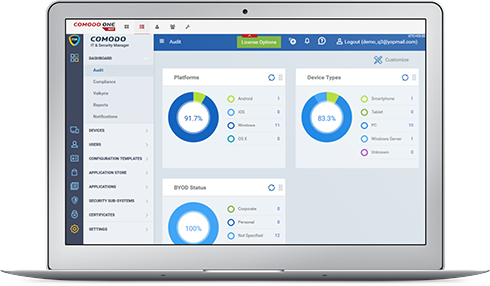 Discovering and tracking every system and software detail becomes simple, efficient, and reliable with Comodo ONE, no matter where the machines you need to manage are located. Re mediate and report on compliance. Automatically identify machines out of policy based on user roles. Automate software installation and patching to operate more efficiently. Simply drag and drop the tasks you want to perform, then save and run. All of the tasks you need to automate are organized into convenient groups and ready to be dropped into your policy. Easily apply a policy to multiple devices or customer sites. Eliminate having to build different policies for different customers. Automatically remediate Service Desk tickets. Be proactive and meet your client's SLA with automatic reporting. Deploy automated discover and alerts for complete visibility into the machines operating in your IT infrastructure. Protect yourself from losing important data. Install automated rules to backup key data and ensure it can be retrieved. Build a good reputation and profit by sharing your expertise with the community. Share, buy and sell automation with the community of customers through Comodo One. Save time and money by taking advantage of Comodo One's huge library of ready-to-deploy scripts. Why IT Automation and Scripting is Free? Based in Hammersmith, London, 76BITS designs, delivers and maintains IT solutions for customers across South East England, as well as Finland and Thailand. For nearly 20 years, 76BITS has been supporting businesses and helping them make the most of available technology to deliver increased performance, efficiency and reliability - from network design to maintenance and upgrades.